Long-time Hunter Thompson fan, friend, and professional pirate Johnny Depp has been obsessed for years with bringing Thompson’s work to the big screen. After befriending the crazed author while filming Fear and Loathing in Las Vegas, Depp picked up The Rum Diary and immediately started working to bring it to the screen. For a decade, the project bounced from studio to studio, with various actors attached and dropping out of the production, depending on how long it was taking. Then, it fell into the hands of Bruce Robinson, the brilliant writer/director of Withnail and I, among other things. 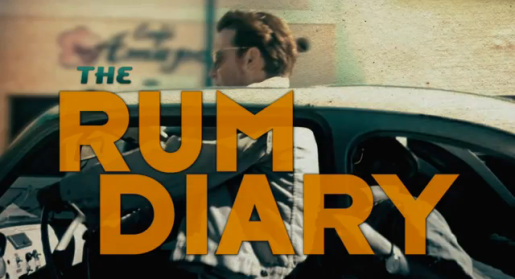 Well, at long last, The Rum Diary is hitting the big screen, and the trailer has been released. The adaptation of Hunter S. Thompson’s 1961 novel, inspired by his experiences in Puerto Rico and the colorful characters he encountered there, is from FilmDistrict and E1 Entertainment. It is scheduled to be released on October 28 and stars Johnny Depp as Paul Kemp, the main character journalist, with Amber Heard as Chenault, the object of his desire. Also in the cast are Aaron Eckhard, Giovanni Ribisi, and Richard Jenkins. I have to say, I’m something of a Thompson nerd (an understatement), and I have to say this looks incredible. I cannot wait for this movie to come out, because it looks like they nailed Thompson’s novel, capturing his mania, comic spirit, and fish-out-of-water story perfectly. Given how well Robinson is as a director and writer, and given Depp’s love and respect of Thompson as a writer, I think this is going to be a great adaptation.